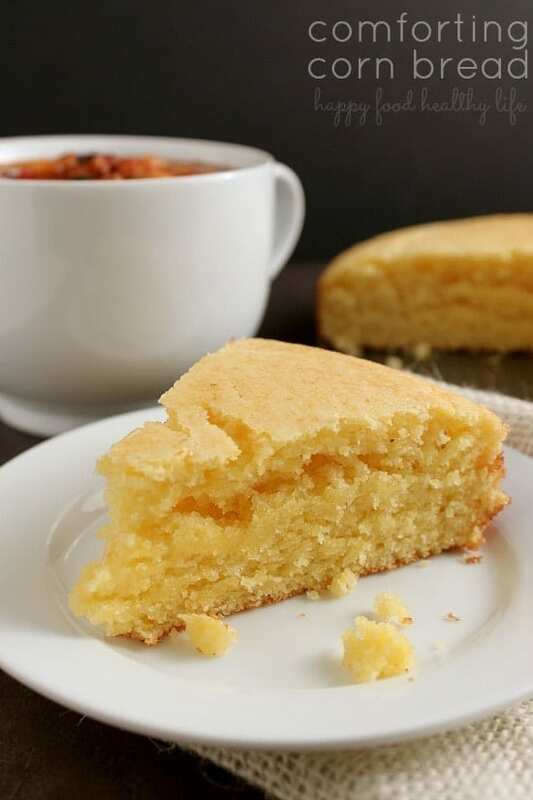 There is just something about corn bread. You take a bite, and it’s like you’re getting wrapped in a blanket. Seriously. It’s some powerful stuff. You know what’s more powerful? 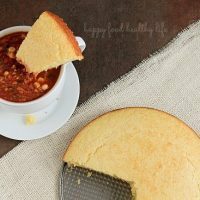 When you combine comforting corn bread with a big bowl of chili that’s been simmering for house. This is truly one of my favorite meals. Especially when it’s cold outside, and even more so when my heart could use a hug. Comfort food. That’s kind of where I’m going this week. I had plans to continue on with another health food week for the last week in January, and then there was a change of events in my heart. I started by baking bread to start putting the pieces back together. And after that, the only thing that sounded good was comfort food. So here we are. 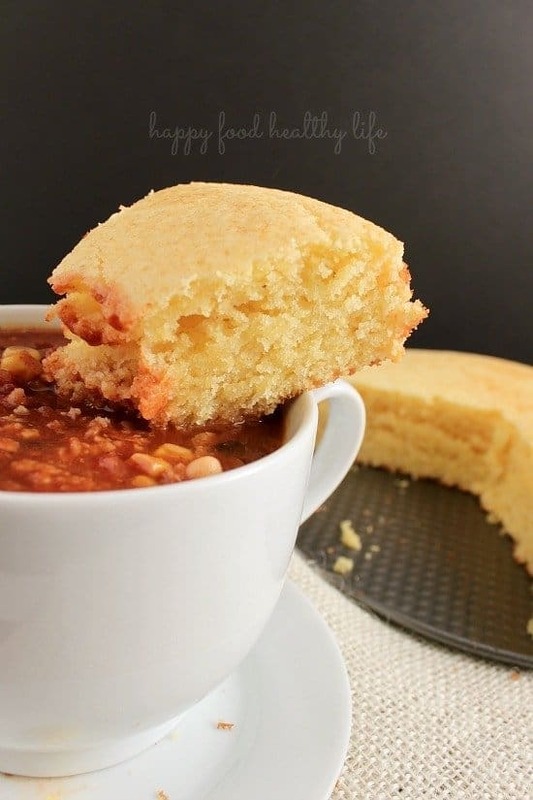 Corn bread is a definite comfort food. I have a few words about comfort food though. People hear comfort food and think they can just throw all caution to the wind and eat their emotions. To me, comfort food doesn’t change the way that I eat. I refuse to stop listening to my body just because I’m upset and feeling the need to over-indulge. It is possible to continue to eat until just satisfied (not overly full) while eating comfort food. You just might have to listen to your body’s cues a little bit harder because they may be masked by your emotions. 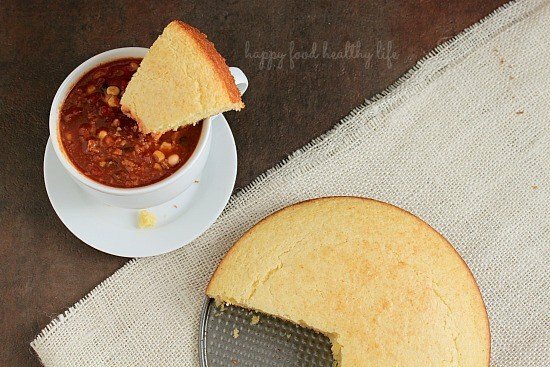 So yes, last night, I did eat my wonderful (if i do say so myself) chili and cornbread. I feel like I could have eaten about half the pan of freshly baked cornbread because I just wanted that hug. But instead, I enjoyed my one piece and took in all it’s comforting qualities. And then I stopped when it was over. Another piece (or 5) wouldn’t have comforted me any more than the first one did. And I knew that. Remember that comfort food can be amazing, but it can also be very dangerous if you aren’t listening to your body and only eating with your emotions. My cornbread. It’s basic. There are no flares. There are no extra features. But… it seriously comes with a hug. You’ve gotta try it. You take that first bite, melt a little bit, and ahh, yup, there it is, you’re engulfed in a hug. Preheat oven to 400 degrees F. Spray or lightly grease a 9-inch round cake pan or springform pan. In a large bowl, combine flour, cornmeal, sugar, salt, and baking powder. Stir in egg, milk, and vegetable oil until well combined. Pour batter in to prepared pan. Bake in preheated oven for about 20-25 minutes, or until a cake-tester inserted into the center of the bread comes out clean. What is your favorite comfort food and do you eat it differently than other foods when you’re in need of comfort? Yum, looks great! Definitely my kind of comfort food =) It looks like a warm hug indeed. It really is a very simple recipe. One bowl. 5 minutes. Throw it in the oven, and it’s done! Can’t ask for more than that! If you are in a hurry, try making cornbread in a waffle maker..nice fast and crunchy. That’s an awesome tip! I will keep it in mind for sure.